After a meeting on that scorching hot afternoon of March 23, 2017, I find myself walking along Taft Ave. from Quirino Ave. and taking photos on the way. The weather felt like it was in the 40s (Celsius) though it was probably around 33-35 degrees that day. I end up in the corner of Taft Avenue and Vito Cruz Street where I spent about an hour at the intersection taking pictures before taking off, resting at a nearby coffeeshop before making my way home a few blocks away from here. The image here of a woman appearing to hold steady an oversized streetlight was taken using a Voigtlander Super Wide-Heliar 15mm f/4.5 Aspherical III on a Sony A6000 with the exposure set to ISO 1250 f/8 at 1/320. I haven’t posted much of my images here lately and realized I was posting more regularly on social media. Maybe because I find it more convenient to just post on Instagram or maybe because I pressure myself to come up with around 90 words or more to accompany each image that I post here on the blog. Follow me, archondigital, on Instagram if you want to keep updated, I post there twice a week at least. Filed under Street Photography. 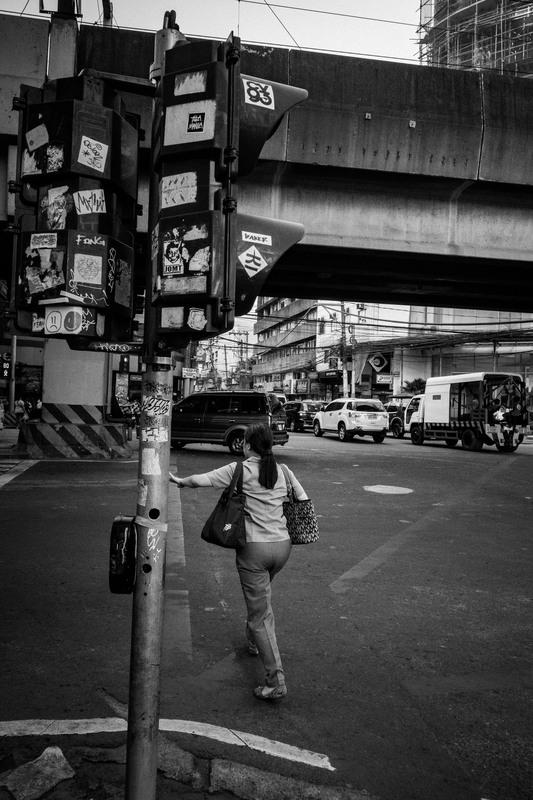 Tagged as 15mm, Malate, Manila, Sony A6000, Street Photography, Streets of Manila, Super Wide-Heliar, Taft Avenue, Vito Cruz Street, Voigtlander.